Let’s talk about buttermilk for a minute. Over the past year or so I’ve slowly become convinced that buttermilk is one of the most underrated ingredients at the grocery store. It used to be one of those things that I’d see at the store and wonder who ever bought it, but now I totally get it. What is buttermilk? Well, it’s not milk with butter added to it (in case you were wondering). It’s a cultured milk product, like yogurt or kefir. Basically, a specific type of bacteria has been introduced to the milk and allowed to grow. As the bacteria grows, it eats up the natural milk sugars and produces an acid byproduct. The acid denatures the milk proteins, causing the texture to thicken up – just like when heat denatures the proteins in egg whites and turns them from a liquid into a solid. All of this “culturing” action produces a unique, tangy flavor and thick, creamy texture. Buttermilk is useful in baking because of its acid pH, which can help leaven muffins, biscuits, and other baked goods. There are many ways you can substitute buttermilk if you don’t have any on hand (see a few options here), but the problem with these substitutes is that, while they do provide acid, they do not provide that unique buttermilk flavor. And boy, oh boy does buttermilk ever have a unique flavor. Granted, I could never drink a glass of it plain (some people enjoy it that way), but when used in recipes it adds the most amazing flavor. Substitutions no longer cut it for me. I need the real thing. The other awesome thing about buttermilk is its rich and creamy texture. The thick texture is a result of the culturing process and not the fat content, so even if you buy a low-fat buttermilk it will still add a thick, creamy texture to whatever you’re using it in. That’s a major bonus when making dips, dressings, and soups. But what are you gonna do? Buy a whole quart of buttermilk, use a cup, and then let the rest go bad in the back of your fridge? I’ll admit, I’ve done that a few times. But then I came across this little gem of a technique! Freezing buttermilk is easy and it’s as good as fresh once thawed! So, promise me that the next time you come across a recipe that calls for buttermilk, you’ll actually go buy a quart, use it, and then freeze the rest. Because you’re going to love it. 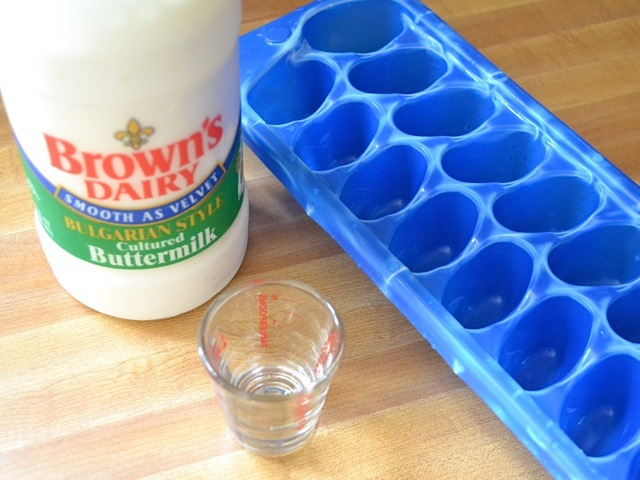 Before you freeze, make sure to measure the volume of your ice cube tray wells. 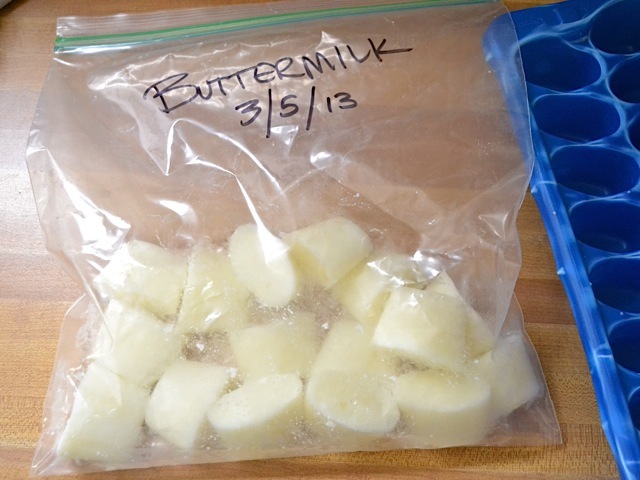 This way you’ll know how many buttermilk cubes you need to thaw for any given recipe. I have that cute little shot glass measuring cup (1 oz. ), but you could also use measuring spoons. My wells were 1.5 Tbsp in volume, which means I’d need to thaw 12 cubes to make one cup. Make sure you write the volume down somewhere, so that you don’t forget. HINT: 1 fluid ounce = 2 Tbsp. 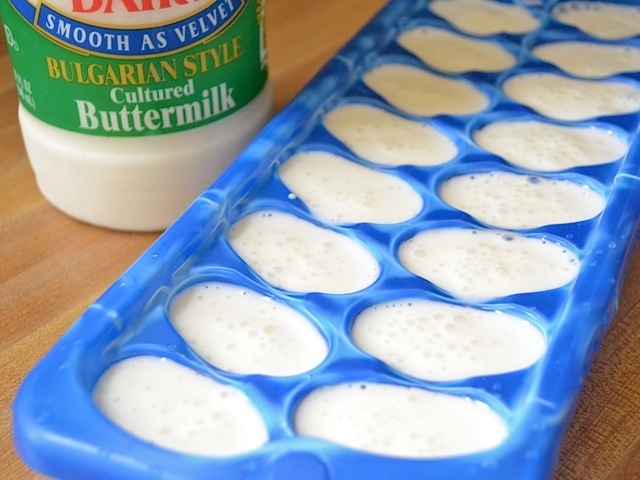 Give the buttermilk a good shake and then carefully pour it into the ice cube tray. It will be a little bubbly or frothy, but that’s okay. 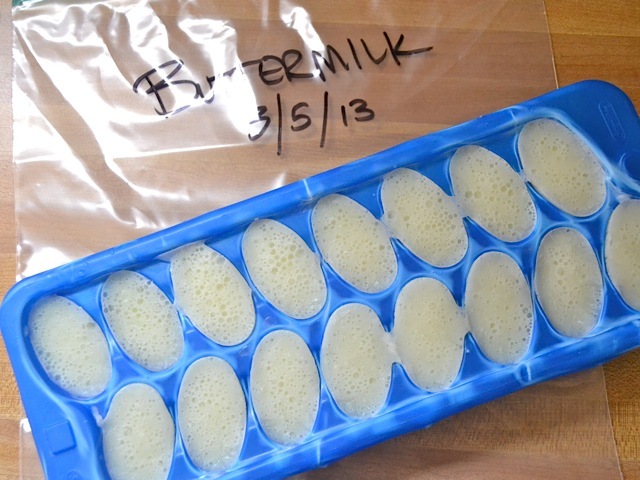 I filled up about two ice cube trays with my leftover buttermilk. Let the cubes completely freeze. You don’t want to leave the cubes in the tray where they’ll be exposed to air and dry out or absorb rogue flavors from your freezer. So, once they’re frozen you will want to transfer them to a freezer bag. Make sure to label and date the bag. You could also record the volume of the cubes on the bag so that it’s always right there where you can find it. If the cubes are stuck in the tray, just let it sit for a minute or so and the outside edges will melt a little and they should loosen right up. Transfer the cubes to the freezer bag and then pop them back in the freezer. Now you have buttermilk ready to go whenever you need it! I thawed out some buttermilk cubes to make Whole Wheat Oatmeal Pancakes and it worked beautifully! The buttermilk separates a little when thawing, but a quick stir mixes it right back up (buttermilk tends to separate when refrigerated, too). Great to know! When we were on a really tight budget and little kids. I would always keep it around for baked goods ie: pancakes, biscuits, etc… from scratch. So I would run out. Old trick I used then was when you get down toward end of carton add reg. milk in and let mix for awhile. Then you had more buttermilk! Now I have to admit it goes bad before I go through it. Thanks for the tip! I ADORE buttermilk, on it’s own and in things. I’ve always been surprised at how many people are put off the idea of it. Maybe they think it will taste spoiled. On the otherhand, yogurt, which I also love is so popular. I told at least one person ‘you’re ok eating yogurt though, right? And cheese? So what’s the difference? Made that person think again. My mother drank it so I did, too from a very early age. Maybe a lot of people need to be brought up on it, as with other somewhat off the wall foods.